Playing is a child’s natural way of communicating and expressing their feelings. 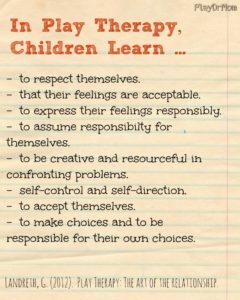 In Play Therapy, the therapist utilizes what is most comfortable for children (PLAY) to create an environment where children can freely express themselves and gain a sense of control over their world. Play Therapy is a way of being with the child that honors their unique developmental level and looks for ways of helping by using the unique language of children which is “play”. Licensed mental health professionals therapeutically use play to help their clients. Toys are specially selected for the play room to facilitate communication, role play, develop positive self regard, responsibility, empowerment, healing, and trauma resolution. Children have not yet developed the vocabulary and ability to fully express themselves verbally, so they are more likely to act out their thoughts and concerns. Adults come to counseling and simply sit and talk, but children have their own special language of play. Acknowledging that this is how children best communicate helps them to feel understood. At Kid Talk, we utilize a variety of toys and activities to help a child move towards healing. Through this process, we are able to learn more about what the child is need and communicate that to the caregiver. We are also able to work through issues using this treatment method. According to the Association for Play Therapy, Play Therapy is an effective mental health approach, regardless of age, gender, or the nature of the problem. Play Therapy is most effective when a parent or guardian is actively involved in the treatment process. We routinely keep parents or guardians involved in the process. At Kid Talk, we are committed to providing evidenced-based therapeutic interventions to promote social and emotional wellness of children and their families.